The Kestrel Portable Vane Mount is an ingeniously simple accessory designed for extreme light weight and portability.The Vane Mount assembles in seconds and the precision pivot and lightweight vane extension allows the unit to spin freely in the slightest of breezes. The incorporated level ensures that the Vane Mount is installed correctly and that direction readings will be accurate.Paired with the Kestrel's 2000 data-point memory log, extensive data can be collected including wind speed and direction. Together, the Kestrel 4500 and Vane Mount weigh less than 227 grams and pack into a compact 5 x 15.25 cm case. 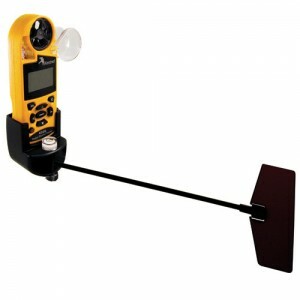 The Vane Mount can be affixed to any tripod for a complete weather station you can easily pack into remote locations.